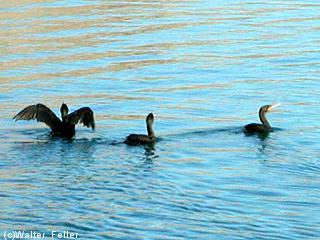 The Double-crested Cormorant is a large black bird 74� cm (29"�") long, with a wingspan up to 132 cm (52"). It has a long tail and a yellow throat-patch, and can appear to have a green sheen in certain lighting. The white double head crest is seen for a short period during the breeding season in western birds; it is duller in eastern birds. Juveniles are brown with a white face, foreneck, and breast.